Ring Shot Mode, new opening movie, and more. Nintendo has released the version 3.0 update for Mario Tennis Aces, which adds the new “Ring Shot” mode, “Yoshi’s Ring Shot” limited time event, and a new opening movie. Ring Shot is a new mode where the goal is to aim for a high score by passing the ball through rings. Up to four players can play on a single Switch console. Standard rules apply regarding energy, but automatically successful blocks will not break rackets. The “Yoshi’s Ring Shot” challenge is a limited time Co-op Challenge with Yoshi that will run until June 1. Players must work together to hit shots through colorful rings and earn points. 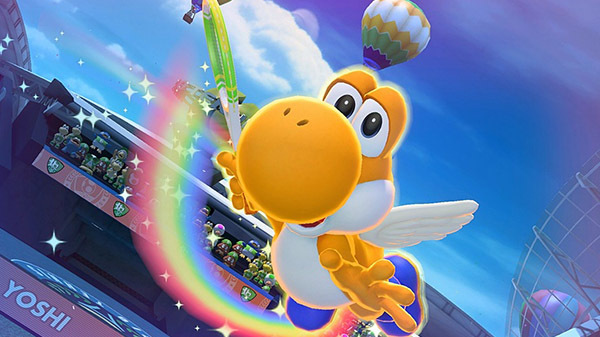 If you collect enough points to reach the target amounts, you can get Yoshis of different colors that can be used in Free Play or in tournaments. If you hit a ball through a ring that is the same color as the Yoshi you are controlling, the frenzy gauge will fill up. Mario Tennis Aces is available now for Switch. Watch new new opening movie and a pair of gameplay videos below.